Anyone looking at a map of the 2017 provincial election results has to notice the "beyond Hope" issue. The interior of Britsh Columbia is largely represented by the Liberal party, whereas the urban areas of the lower mainland and island are represented by the NDP. At the same time, Metro Vancouver is calling foul when it comes to school and property taxes. Just a heads-up. Read more about Rural-urban divide? This webinar follows-on from my previous video in which I looked at the 2017 Area F budget. One of the things I teach at Simon Fraser University is a course called Business Analytics. Part of that course is the emerging field of "visual analytics", which is really just a fancy way of saying charts and graphs. 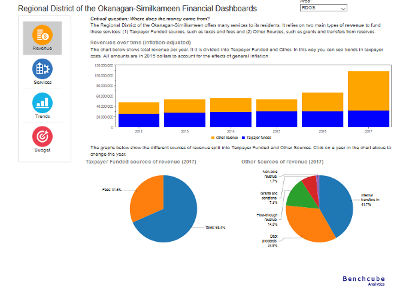 I personally am a big fan of charts and graphs and have been trying to create a tool to translate the massive RDOS budget into a series of pretty pictures. The following letter was submitted to the Penticton Herald (link here). I had something to do with the structure of the tax to support the Conservation Fund so I feel I should respond to some of the points Mr. Llewellyn raises. My comments are bolded below. Re: Regional District of Okanagan Similkameen’s proposed Bylaw No. 2690, 2016. The consultant recommends a 30% variable + 70% fixed rate with a farm rate. Public information sessions will be held on this issue in early November. Standby for more information. As frequent readers (?) of this site know, I have scaled down my postings and monthly digests over the summer. This is primarily because I became very busy at my real job. And let's face it, the real job, not the RDOS rural directorship, pays the bills. Just a follow-up to the February 2nd, 2016, meeting in the old Summerland library: I have attached the two relevant pages for the 2016 Budget. The first is the operating budget for the water utility. It shows the revenues for the system, including the parcel tax ($136,390/79 = ~$1,726 per household). The second is the "capital projects" budget, which is meant to be temporary (lasting for the duration of the capital project). The capital budget shows the large amounts in (debt proceeds and grants) and the large amounts out (capital spending). The "steady state" revenue and expenses are shown in the operating budget. The Regional District of Okanagan Similkameen has politely declined participation in a four-party master plan for a bike link between Penticton and Summerland along Highway 97. The B.C. government proposed a study on a multi-use trail linking Trout Creek to Penticton with the cost being shared by the province, City of Penticton, RDOS and District of Summerland. The master plan would cost $110,000, with each partner's share being $27,500. If approved, the trail would cost around $7.8 million.